January birding on Wednesdays was a lot of fun. I got a bird identification book for my birthday, which makes things so much easier! 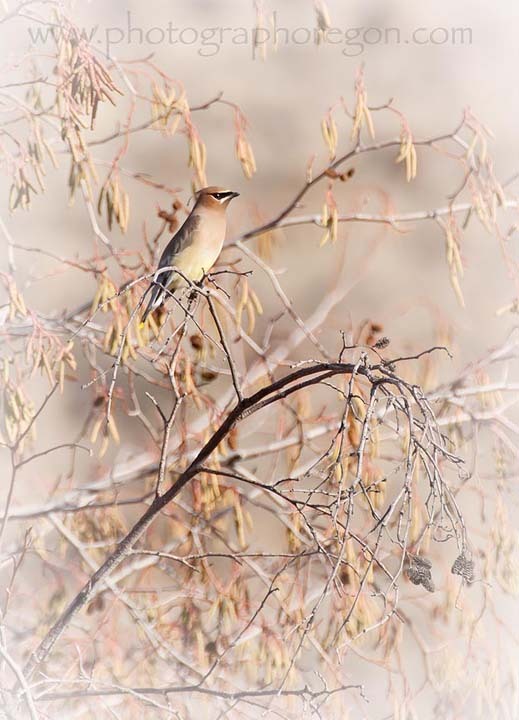 We started with the Oakridge Christmas Bird Count on Januaury 3rd (which you might not know was actually a Tuesday). 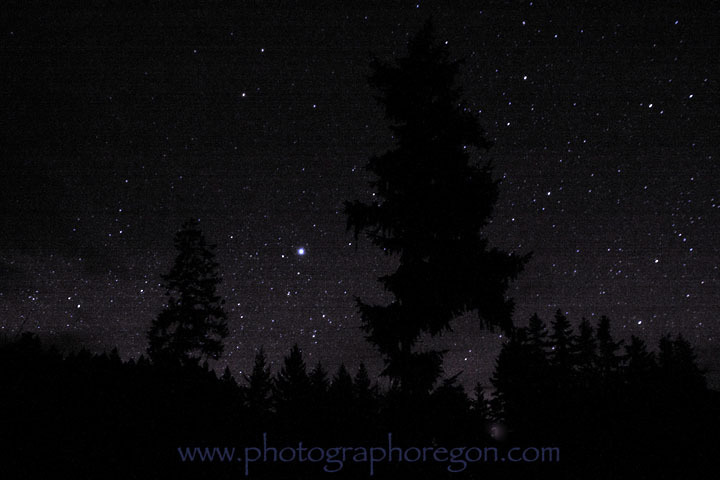 Really we drove over to Oakridge and scouted a little so we could get up in the dark on Wednesday morning and hoot for owls …yes really… you can read more about that Wednesday birding here at the bottom of the page. 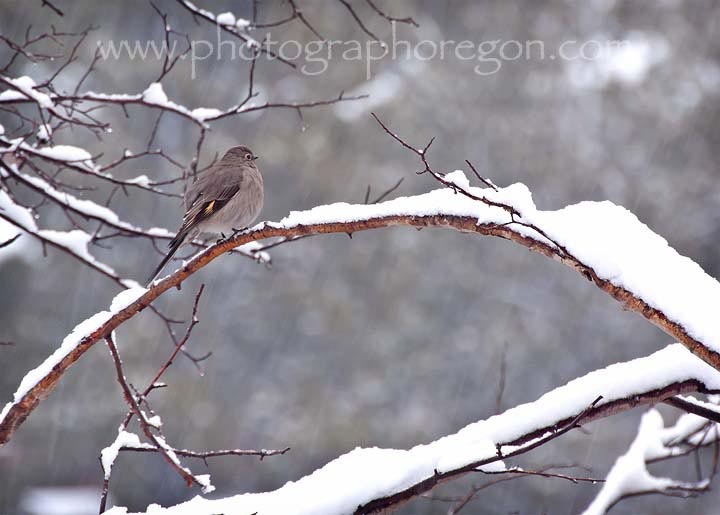 This day for January birding we went to Suttle Lake and in the snow up on the Santiam Pass. 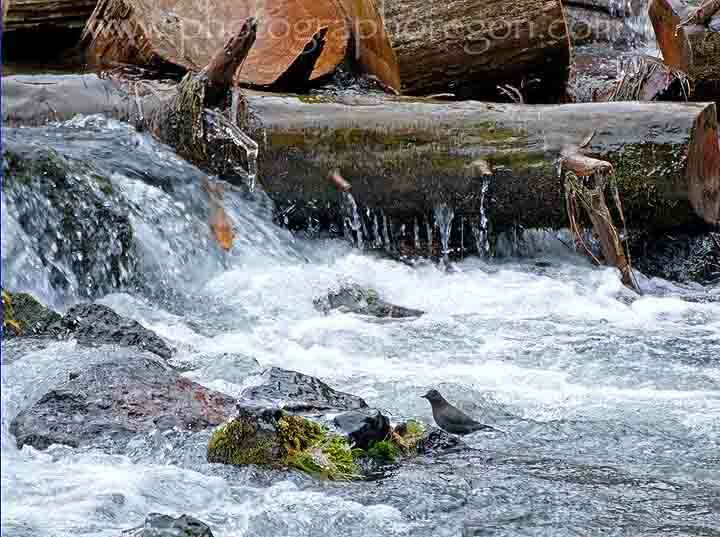 At Suttle Lake we saw a dipper playing in the water. I am becoming very fond of them. 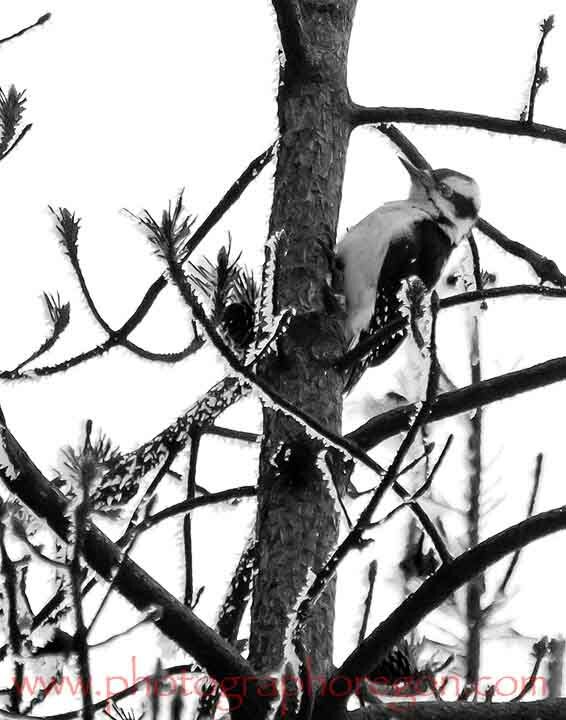 Everyone made it their goal to find me a woodpecker that was not a Northern Flicker. 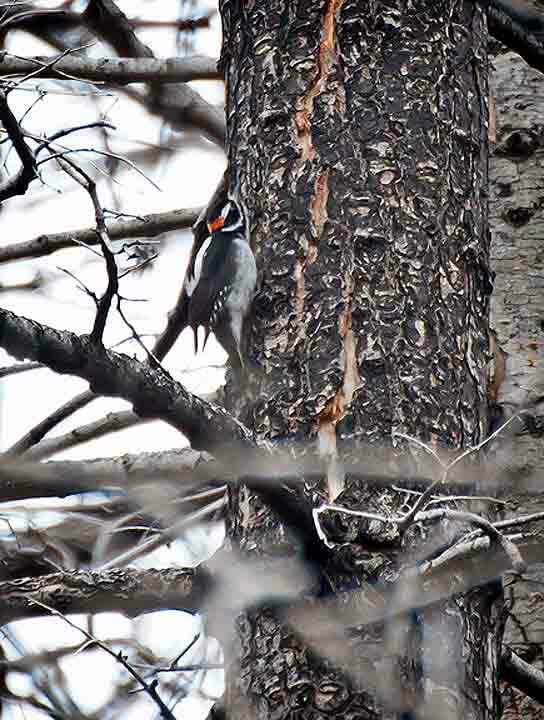 We succeeded in finding a female Hairy Woodpecker in the Shadow Lake burn area. There were lots of them but this one stayed close and accommodated the photographer. I showed no inclination to contest her for bugs so I guess I was okay. She's so cute she makes me want to find one of those stuffed ones and squeeze it to hear what she sounds like.....and on the way out we found a little boy too! 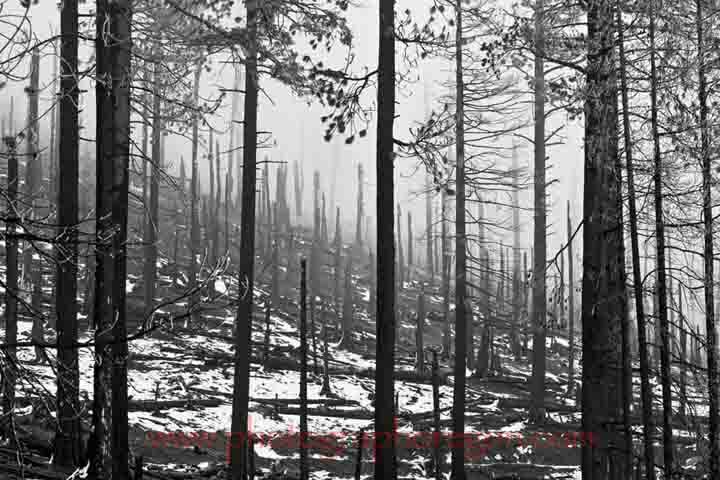 The Shadow Lake burn area is also home to some stark interesting landscapes. This day was frosty and while this looks like a black and white landscape, there really were no other colors there. 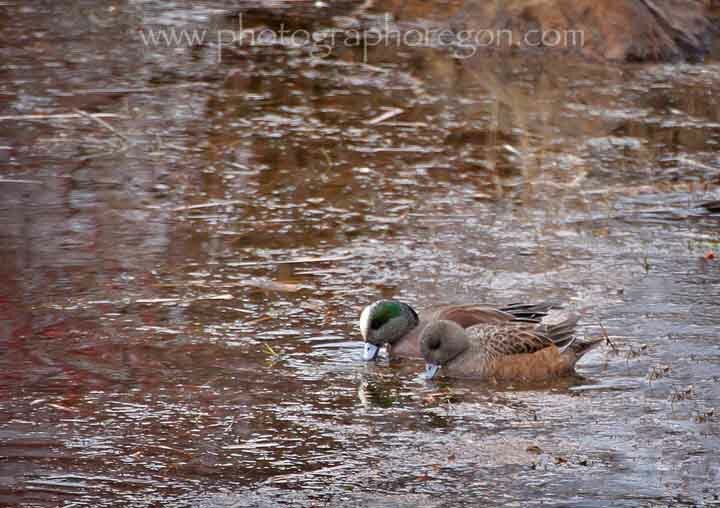 You would think that I would have had enough but on my way home while going over the bridge on Newport, I spotted some ducks that didn’t look like Mallards which could possibly grab me another life bird for the day so I stopped and true enough, there was a pair of American Wigeons. What pretty little things they are! This January birding Wednesday it was dumping snow. A lot of the crew had gone to California and so just Howard and I braved it to the meeting spot. We decided to abandon the cause for the day….but….on the way home (that seems to be a favorite theme for me..) I decided to hit up the First Street Rapids and see if I could get some nice landscapes of the first big snow of the winter and maybe even some shots of the lovely swans that hang out there. 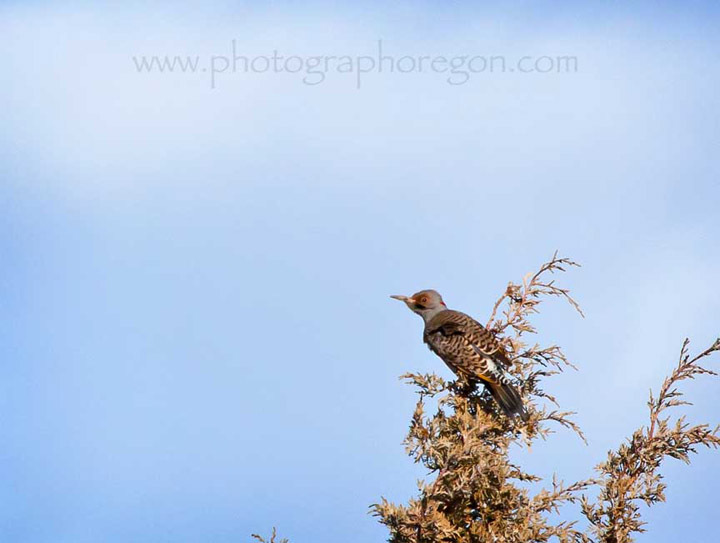 As soon as I got there I spotted this poor cold Townsend’s Solitaire up in a tree. It was the first time I really got to see one up close and sitting still. I looked up the river and I saw the swans so I went off on search of them. They led me up the trail in the deep snow for a while and then….vanished. Humph. Well, I got the Solitaire, and I’m happy with it. 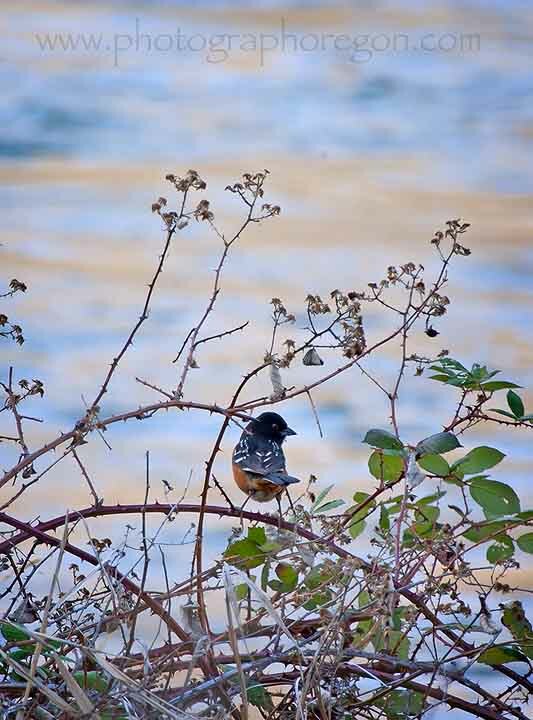 This Wednesday of January birding took us to Madras and through Gateway to Trout Creek. I got a lot of life birds that day and also saw some favorites. As we were heading down the back road Kim spotted a Yellow Shafted Flicker in a tree. They are much harder to find in Central Oregon than the Red Shafted and I had never seen one. Here he is, looking a little ruffled. 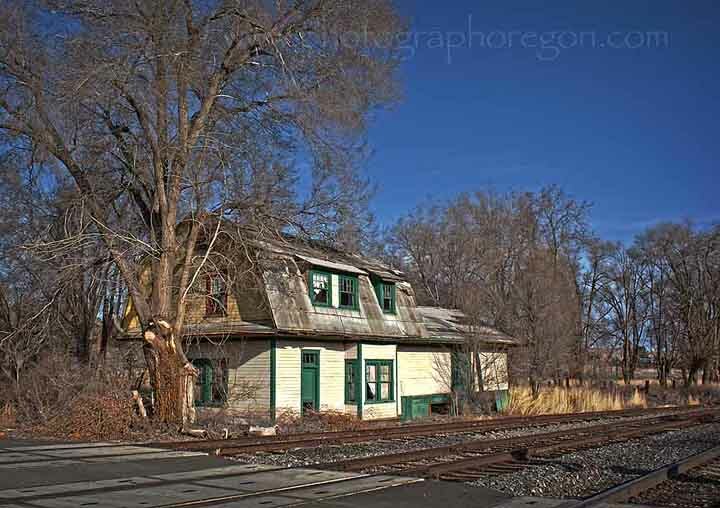 We came in to the tiny town of Gateway, Oregon and I could not resist a shot of the old train station. Someone needs to refurbish it as a Whistle Stop Café! 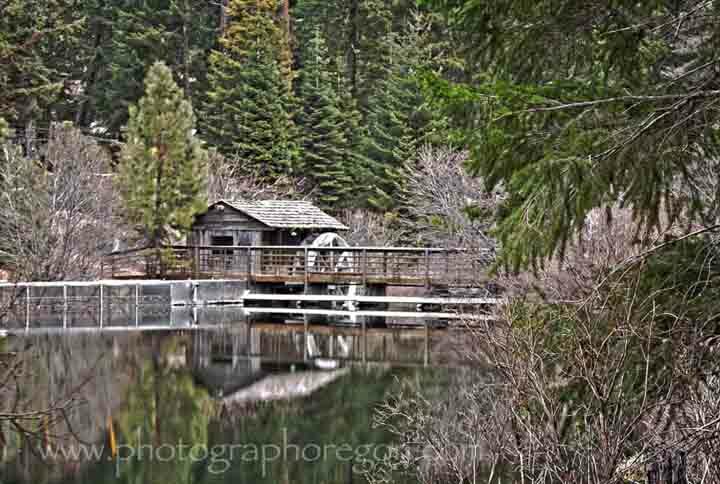 This is an HDR image. I’m sure there are some birds inside there. 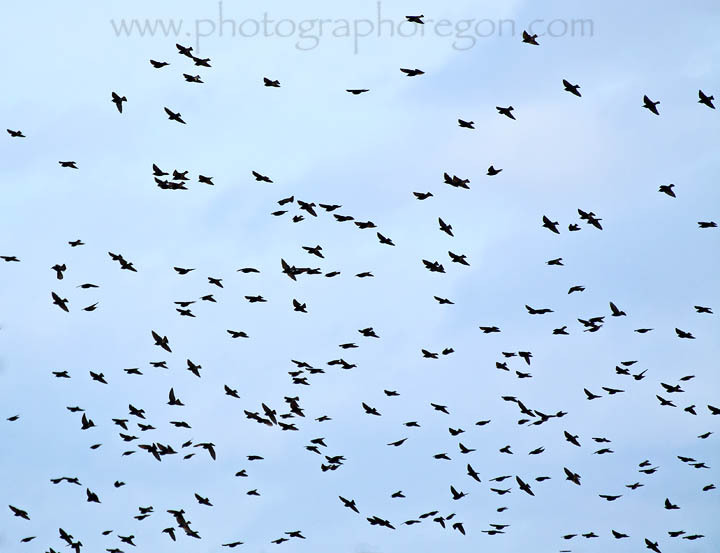 Along the road to Trout Creek we found a super active flock of happy Cedar Waxings. They were a lot of fun to watch playing in the trees. In the same area was a Black Capped Chickadee and a Yellow Rumped Warbler. 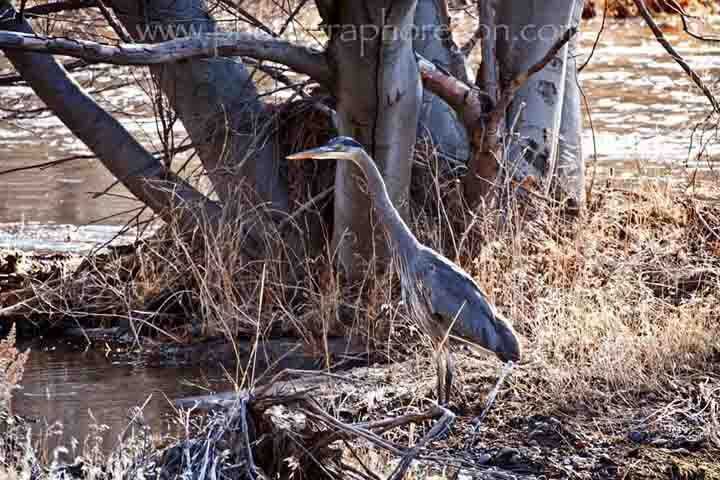 On our way back we stopped along the creek to see a Canyon Wren and spotted this lovely young Great Blue Heron. We were very close to it! Judy really wanted to see the Brewer’s Blackbird flocks that had been sighted in the area, but all we found were lots and lots of Starlings. They make for a nice stock background though!